When it comes to buying a collection of stocks, there are two different ways one can invest in – via Mutual Funds or ETFs (Exchange Traded Funds). Since both have “funds” in it’s name, what is the difference between both? And which is better for an ordinary retail investor? 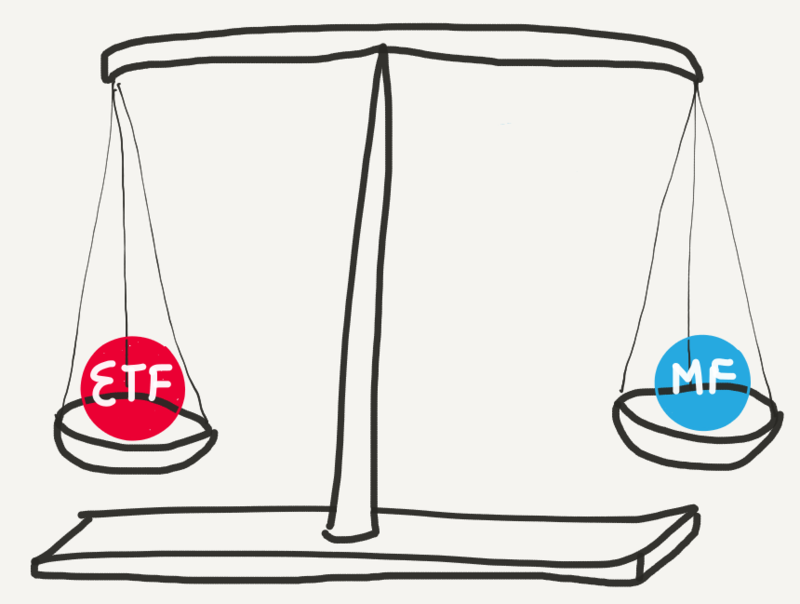 ETF vs Mutual Fund – it is one common question lot of beginners have while investing. Wikipedia says “Mutual Fund is a professionally managed investment fund that pools money from many investors to purchase securities.” Note that I have added emphasis on the “professionally managed” part. That means there is a fund manager who’s only job is to manage the investor’s money and purchase the best security based on what the fund’s goals are. So if you are investing in an mid-cap equity fund, the fund manager is supposed to pick a few specific mid-cap stocks from the list of thousands of stocks and put in all the money you give in it. Since each mutual fund has a fund manager who is actively managing the fund, he charges a small percentage of your money (typically 1%-2.5%). This is called the “expense ratio” of the fund and it is what pays everyone in the fund house – right from the fund manager to the security guy in their office. This expense ratio is also what pays the mutual fund advisor his fees for advising you to buy a fund. So every time you do a SIP in your fund, a small percentage of your money goes to everyone involved in this fund. The price of one unit of a fund is calculated every day called its Net Asset Value (NAV) and any money you give will fetch you an equivalent quantity of the mutual fund. Usually you can get units upto 4 decimal points. An exchange-traded fund (ETF) is an investment fund traded on stock exchanges, much like stocks. ETFs track an index like Nifty or Sensex or Gold price. A Nifty ETF will hold all the stocks in the Nifty index and will naturally be priced close to the value of the Nifty Index. If you see this graph of Nifty BeES, you will see that there is practically no difference between the red and black lines. Similarly a Gold ETF will track the price of the gold. Whenever a share is removed or added to the Nifty Index, the fund manager replicates the exact transaction and so the price of the ETF will match the Index price. The fund manager is “passively managing” your money and the expense ratio will be very very low compared to active managers. The minimum ETF you can buy is 1 unit and you can’t get fractions of units – only multiples of 1 unit. Since ETFs are continuously traded in the market, the price of the ETF continuously changes depending upon the value of the index. So if you have invested in an ETF and one fine day you see that the markets are falling rapidly, you can immediately call your broker and sell some units before the market falls even further. Compare this with mutual funds, the NAV of the fund is calculated at the end of the date based on the closing price of each stock. So if you want to buy or sell some units you have to give the order before 3PM and the order will be executed based on the NAV of the fund at the end of date. So if the market falls, you will be unable to get out of the units fast enough. To know how your investments are doing, you just have to look at the index price of that day and you can easily know how it performed. Simple and no-frills investing. When are Mutual Funds good? Despite being slower to react, mutual funds does have it’s own advantages. Primary advantage being that it is actively managed. Even though you pay a little extra for the fund manager, you are giving your money to professionals who know how to play this game. Professionals with teams who are much more intelligent and with resources to evaluate which companies are good to invest. Imagine you doing this for each of the 1000s of stocks without proper training in fundamental analysis. I would prefer to give my money to the professionals than poring over hundreds of pages of financial statements. And since Mutual Fund managers are paid to beat the indexes you will definitely get better returns than ETFs over a longer period. And the risk of market falling a by thousands of points in a single day is very rare. The Risk-Reward ratio of the extra returns of Mutual Fund is better than ETFs. At the end of the day it is up to you to decide whether to invest in ETFs or Mutual Funds. Personally I have invested in both ETFs and Mutual Funds. I have a few lakhs of rupees in ETFs invested over 2-3 years ago, but am still continuing my SIPs in multiple Mutual Funds. In India at least, the equity market is still not mature enough and it is very easy for fund managers to easily beat the returns of a general index. So I would prefer to invest in Mutual Funds. Which do you want to put your money in? Comment below about your preference and why? is there any good calculator to get tracking error?